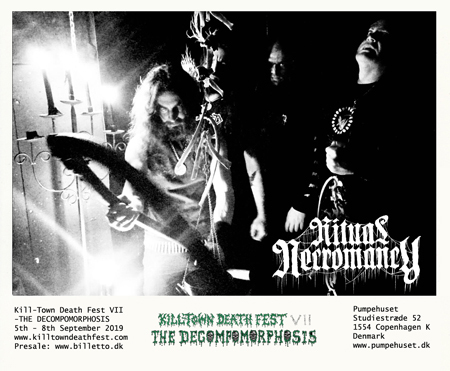 Killtown Death Fest » Announcement #13: Ritual Necromancy (us) returns to KTDF VII!!! Announcement #13: Ritual Necromancy (us) returns to KTDF VII!!! Tonight we welcome back one of Portland’s finest, who last played Kill-Town back in 2014 for the “Funeral Edition”. Last year in 2018, they released via Dark Descent Records, one of our favourite albums of the year. So its with great pleasure we can announce that RITUAL NECROMANCY will play Kill-Town Death Fest VII!!! Uncompromising, suffocating, and evil – Ritual Necromancy’s approach to death metal is that of predator to prey, sinking its teeth into the listener with violent intent. Spawned in 2008, Ritual Necromancy haunted Portland, Oregon’s local death metal scene and recorded a self-titled demo. A pact with Dark Descent Records was forged and in 2011, “Oath of the Abyss”, the first offering to the grave, was unleashed. That same year, Ritual Necromancy joined forces with Impetuous Ritual, Grave Upheaval, and Cruciamentum for a maniacal West Coast tour to the infamous Rites of Darkness III Fest, where the band twisted some heads and turned many stomachs. 2014 saw the release of a 3-song EP entitled “Void Manifest,” which conjured a short tour with Bölzer, culminating in the slaughter of Vancouver’s Covenant Festival. That year, Ritual Necromancy also invaded Europe for the first time, unleashing their punishment upon the hordes of Kill-Town Death Fest´s Funeral Edition, then continued the carnage across Europe with Canadian titans Mitochondrion and Auroch. “Disinterred Horror”, the long-anticipated second full-length album, finally rises from the grave in 2018 to much fetid acclaim. Relentless and bludgeoning, “Disinterred Horror” strangles you with unseen hands, tormenting your soul long after it’s over. Like a nightmare you can’t shake, the malevolence of this album settles in your brain, landing it on many “Best of the year” lists. 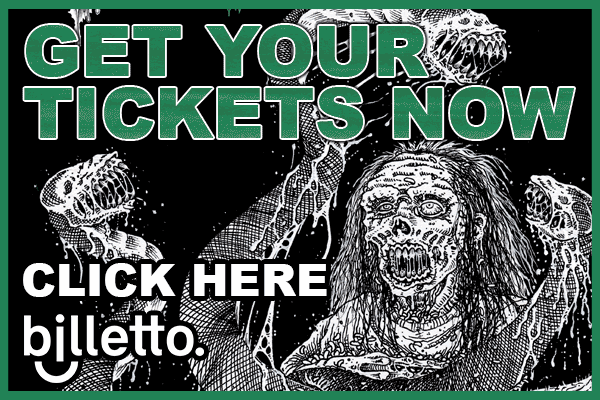 Also in 2018, Ritual Necromancy savaged audiences at Invoking Black Death and Maryland Deathfest with morbid ferocity. As 2019 emanates from the pit, no continent or grave is safe from these practitioners of Death’s Metal, as a short attack on Mexico and later dates in Europe have been conjured. Now Ritual Necromancy returns the chaos to KTDF as they drag you deep into the hell of necrotic torment. Possessed Death Metal by fiends who worship the Freezing Void, Ritual Necromancy is not for the weak.